knight, who pricked after them with all his might, his spear ready levelled. At length. the latter overtook the hindmost of the two knights, and compelled him to turn and face him; but the other still pursued the maid, who flew as fast in front of him, and never stopped till she saw Sir Artegall. To him she ran at once, in glad haste, hoping to get help against her enemy; and Artegall, seeing her approach, went forward to relieve her fear, and to prevent her foe from hurting her. But the pursuing knight, greedy as a hound after his prey, still continued his course, thinking to overthrow Sir Artegall with his spear. Thus alike sternly resolved they met fiercely. But Artegall was the stronger, and better skilled in tilt and tournament, and he hurled the other out of his saddle quite two spears' lengths. The Pagan knight, unluckily for himself, pitched on his head, broke his neck, and was killed on the spot. Meanwhile the third Knight had defeated and slain the second of the villains, and leaving him there dead, he ran on to overtake his companion. 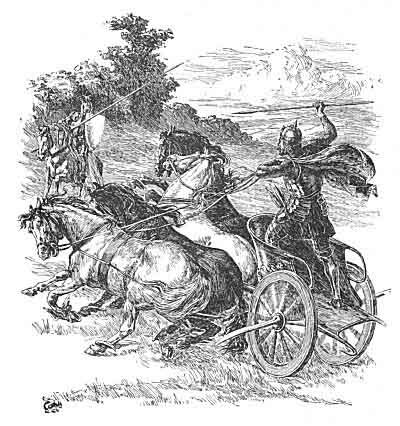 Instead of him he found Sir Artegall, and not knowing he was also on the side of the damsel, he ran at him without thinking; and the latter, seeing him approach so fiercely, made against him again. So they met, and struck strongly, and broke their spears; yet neither was dismounted, though they both shook to and fro, and tottered like two towers quaking in a tempest. seen the end of both her foes, now beheld her friends beginning for her sake a more fearful fray, she ran to them in haste, crying to them to stay their cruel hands until they both heard what she had to say to them. "Ah, gentle Knights," she cried, "why do you thus unwisely wreak on yourselves another's wrong? I am the injured one whom both of you have aided. Witness the two Pagan knights whom ye may see dead on the ground! What more revenge, therefore, do you desire? If more, then I am she who was the root of all. End your revenge on me." When they heard her speak thus, and saw that their foes were indeed dead, they immediately stayed their hands, and lifted up their visors to look at each other; and then Sir Artegall saw that his adversary was none other than Prince Arthur himself. Filled with admiration for his gallant and noble bearing, and touched with the deepest affection, he drew near, and prayed pardon for having unknowingly wronged him, offering to yield himself to the Prince for ever, or to any penance he chose to inflict. "Truly, I need more to crave the same pardon, for having been so misled by error as to mistake you for the dead man. But since it pleases you that both our faults shall be forgotten, amends can soon be made, since neither is much damaged thereby." Thus their perfect friendship was easily restored, and they embraced lovingly, each swearing faithfully on his blade never thenceforth to nourish enmity against the other, but always mutually to maintain each other's cause. Then they called the damsel, and asked her who were the two foes from whom she was flying so fast, and who she was herself, and what was the reason why she was pursued by them. The maiden, whose name was Samient, replied that she was in the service of a great and mighty queen called Mercilla, a Princess of great power and majesty. She was known above all for her bounty and sovereign grace, with which she supported her royal crown, and strongly beat down the malice of her foes, who envied her, and fretted, and frowned at her happiness. In spite of them she grew greater and greater, and even to her foes her mercies increased. Amongst the many who maligned her was a mighty man dwelling near, who, with cruel spite and hatred, did all in his power to undermine her crown and dignity. Her good knights, of whom she had as brave a band as any Princess on earth, he either destroyed, if they stood against him, or else tried to bribe slyly to take his part. And not content with this, he was always trying by treacherous plots to kill Queen Mercilla. her people. She therefore sent me on a message to treat with her, by way of negotiation, as to some final peace and fair arrangement, which might be concluded by mutual consent. "At all times it is customary to afford safe passage to messengers who come on a just cause, but this proud dame, disdaining all such rules, not only burst into bitter words, reviling and railing at me as she chose, but actually thrust me like a dog out of doors, miscalling me by many a bitter name, who never did any ill to her. Then lastly she sent those two knights after me to work me further mischief, but thanks to Heaven and your valour, they have paid the price of their own folly." So said the damsel, and showed herself most grateful to Prince Arthur and Sir Artegall for their aid. The Knights, having heard of all the wrongs done by the proud dame Adicia, were very indignant, and eagerly desired to punish her and her husband, the Sultan. But thinking to carry out their design more easily by a counterfeit disguise, they arranged this plot: first, that Sir Artegall should array himself like one of the two dead knights, then that he should convey the damsel Samient as his prize to the Sultan's court, to present her to the scornful lady, who had sent for her. Artegall refused to take off his armour, fearing to be discovered. Soon after, Prince Arthur arrived, and sent a bold defiance to the Sultan, requiring of him the damsel whom he held as a wrongful prisoner. The Sultan, filled with fury, swearing and cursing, commanded his armour to be brought at once, and mounted straight upon a high chariot, dreadfully armed with iron wheels and hooks, and drawn by cruel steeds, whom he fed with the flesh of slaughtered men. Thus he came forth, clad in a coat of mail, all red with rust. The Prince waited ready for him in glistering armour, right goodly to see, that shone like the sun. By the stirrup Talus attended, playing his page's part, as his master had directed. So they went forth to battle, both alike fierce, but with different motives. For the proud and presumptuous Sultan, with insolent bearing, sought only slaughter and revenge; but the brave Prince fought for right and honour against lawless tyranny, on behalf of wronged weakness; trusting more to the truth of his cause than in his own strength. his spear, he was past and gone; yet still he followed him everywhere, and in turn was followed by him. lion, the Prince sought to get at his foe; but whenever he approached, the chariot wheels whirled round him, and made him fly back again as fast; and the Sultan's horses, like hungry hounds hunting after game, so cruelly chased and pursued him that his own good steed, although renowned for courage and hardy race, dared not endure the sight of them, but fled from place to place. Thus for a long while they rushed to and fro, seeking in every way to find some opening for attack; but the Prince could never get near enough for one sure stroke. Then at last from his victorious shield he drew the veil which hid its magic light, and coming full before the horses as they pressed upon him, flashed it in their eyes. Like the lightning which burns the gazer, so did the sight of the shield dismay their senses, so that they turned back upon themselves and ran away with their driver. Nor could the Sultan stay their flight with reins or accustomed rule, as he well knew how; they did not fear him in the least--their only fear was that from which they fled dismayed, like terrified deer. Fast as their feet could bear them they flew over hill and dale. In vain the Pagan cursed and swore and railed, and dragged with both hands at the reins; he called and spoke to them, but nothing availed. They heard him not, they forgot his training, they went which way they chose, heedless of their guide. Through woods and rocks and mountains they drew the iron chariot, and the wheels tore the Sultan, and tossed him here and there from side to side, crying in vain to those who would not hear his crying. And all the while Prince Arthur pursued closely behind, but could find no means of smiting his foe. At last the horses overthrew the chariot, which was turned topsy-turvy, and the iron hooks and sharp knives caught hold of the Sultan and tore him all to rags. Nothing was left of him but some bits of his battered and broken shield and armour. These Prince Arthur gathered up and took with him that they might remain as a token, whenever the tale was told, of how worthily that day, by Heaven's decree, justice had avenged herself of wrong, so that all men might take warning by the example. Therefore, on a tree in front of the tyrant's door, he caused them to be hung in the sight of all men, to be a memorial for ever. When the Lady Adicia from the castle height beheld them she was appalled, but instead of being overcome with fright, as another woman might have been, she immediately began to devise how to be revenged. Knife in hand, she ran down, vowing to wreak her vengeance on the maiden messenger whom she had ordered to be kept prisoner by Sir Artegall, mistaking him for her own knight; and coming into her presence she ran at her with all her might. But Artegall, being aware thereof, stayed her cruel hand before it reached Samient, and caught the weapon from her. Thereupon, like one distracted, she rushed forth, wherever her rage bore her, frantic with passion. Breaking out at a postern door, she ran into the wild wood, where, it is said, on account of her malice and cruelty she was transformed into a tiger.